These courses are no longer available from Access Training Academies. Our professional decorating courses offer you expert painting and decorating training with an accredited qualification at the end, allowing you to jump head-first into your new career with all the necessary certifications. Though our courses are conducted over a short space of time, we also appreciate that work, life and family commitments can get in the way and affect your training. That’s why we’ve designed our decorating courses to be personalised and flexible, fitting in with your life and around your commitments, allowing you to really make the most of your training. 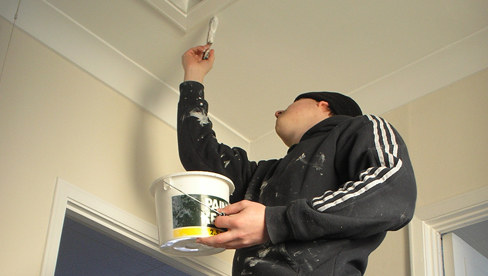 We offer painting and decorating training for people of all ages, genders, and indeed locations within the UK! Whether you’ve no practical decorating experience whatsoever or you’re looking to gain further accreditation and improve your existing skillset, Access Training Academies can provide bespoke decorating courses to meet your needs. We like to keep our classes small, allowing you to make the most out of your training and get plenty of one-on-one time with your tutor. Our painting and decorating courses are highly intensive, meaning you’ll be ready to take your new qualification into a working environment in no time. We can help you achieve your ambitions by creating bespoke, personalised training programmes specifically to meet your needs. Access Training Academies also offer professional courses in plumbing, electrical work, carpentry and gas engineering to name but a few. Access Training Academies boast a truly remarkable pass rate – many of our training courses have a pass rate of almost double the national average! Our painting / decorating courses are delivered in fully-equipped training facilities where you’ll have plenty of opportunities to practise your new skills. You can take your painting and decorating training at your own pace, ensuring that you get the most out of your course and learn in a way that suits you.